The Add Source and Source: ... General pages of the Administration Tool present the parameters with which you can configure the connector for most OpenText Content Server (OTCS) setups. More advanced and more rarely used parameters are hidden. You can choose to make one or more of these parameters appear in the Add Source and Source: ... General pages of the Administration Tool so that you can change their default value. Consider changing values of hidden parameters when you encounter issues. The following list describes the advanced hidden parameters available with OTCS sources. The parameter type (integer, string…) appears between parentheses following the parameter name. This ID of the node enabled on the OTCS server used for the content deletion process. The parameter value can either be an UndeleteWS or a Recycle Bin node ID. The default value is -1, which tells the connector to ignore the parameter. When available, you find the Recycle Bin node ID after objID= in the Content Server URL. The parameter is necessary when the connector cannot automatically detect the UndeleteWS node or Recycle Bin ID, which is necessary to take account of deleted items during incremental refreshes. Whether to add anonymous access if "public access" is specified on the content object. The default value is False. Whether to use the content types returned by OTCS instead of "binary file". The default value is False. Note: When you set the parameter value to True, update the document type set used by your OTCS source to ensure all content types returned by OTCS are indexed (see Modifying the Document Type Set Used by a Source) . Number of items to fetch per request made to the OTCS. The default value is 256. The minimum value is 1. A small value forces the connector to make small but frequent queries to OTCS. A larger value leads to larger and less frequent queries. The path and file name of a custom configuration file. In rare cases where the connector encounters communication issues with Windows Communication Foundation (WCF), you can modify the way in which the connector communicates with OTCS by creating and specifying a custom configuration file (see the Microsoft document Configuring Services Using Configuration Files). By default, this parameter is empty so that all supported OTCS item types are indexed. You can use this parameter to restrict the types of OTCS items to indexed by entering only the OTCS item types that you want to index, separated by a semi-colon ;. 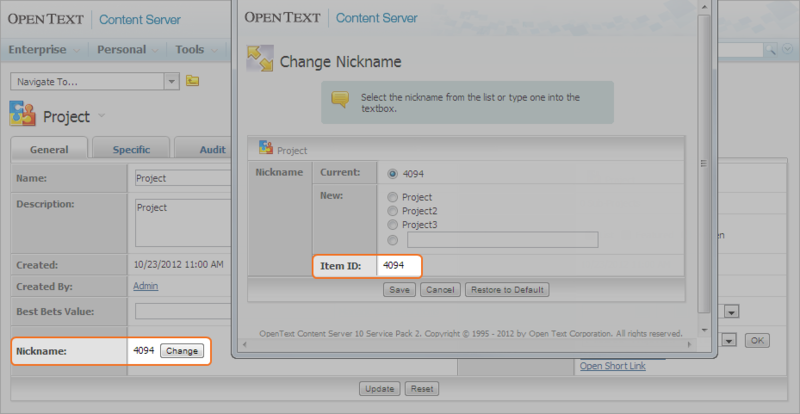 You can easily find the values to enter in this parameter from the Type of items in OpenText Content Server. In the OTCS Workspace, simply hover a discussion item. The tooltip indicates the value to enter in the parameter. Note: CES 7.0.6942+ (August 2014) The Addresses parameter replaces it (see Configuring and Indexing an OpenText Content Server Source). By default, the connector crawls the whole OTCS content from the Enterprise Workspace root. You can use this parameter to specify to start crawling from another root node or from a subnode by entering the node ID. You can find this ID for a node in OTCS by clicking the Functions icon of an item, selecting Properties > General on the menu, clicking Change next to Nickname, and then read the Item ID value. Example: When you want to create an OTCS source only for one project, in the project General property tab, read the Item ID value, like 4094 in the following example. Note: Using certain item types as the root node will result in an error when retrieving their permissions. All item types receiving their permissions from their parents (such as Task, News, all types under Discussion, and possibly other types) are not supported as the root node. This parameter determines the number of threads used to simultaneously crawl OTCS. The default value is 1. By default this parameter is set to True to instruct the connector to perform additional OTCS requests to extract all node metadata and allow to get the OTCS Category data. When you do not want to index OTCS Category data, set this parameter to False to roughly double the crawling speed. 10sp2 - The default to crawl an OpenText Content Server source. 9.7.1 - To crawl a Livelink source. When set to True, this parameter instructs the connector to retrieve the OTCS users. The default value is False. Example: When the authors of OTCS documents are user IDs, not the user names, set the RetrieveUsers parameter to True to retrieve the users. You can then map the user IDs to the user names so that in the search results, you can display user names rather than user IDs. Refer to Adding an Explicit Connector Parameter to add one or more OpenText Content Server hidden source parameters. Under Sources, click the existing OpenText Content Server source in which you want to modify the newly added advanced parameter. Rebuild your OpenText Content Server source to apply the changes to the parameters (see Applying an Action to a Collection or a Source).